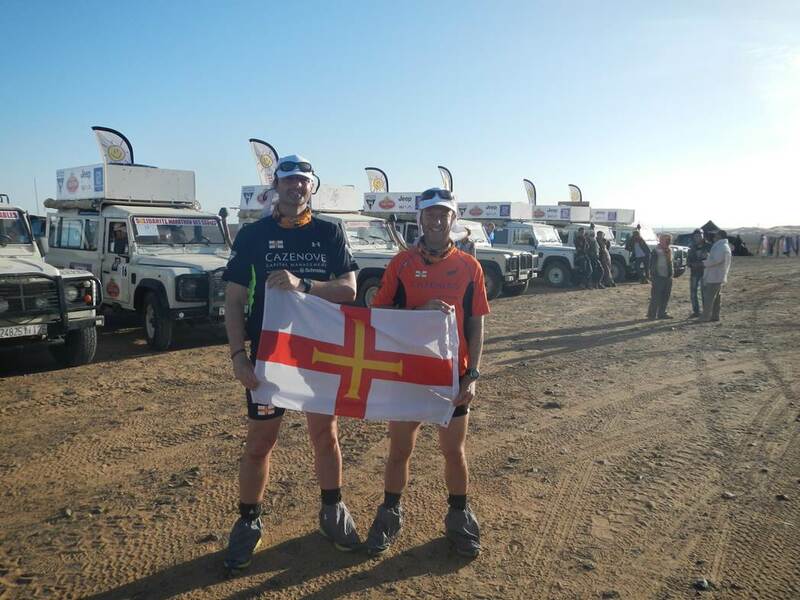 The annual Marathon des Sables is renowned as ‘the toughest foot race on Earth’ but it might equally be described as the ultimate exercise in human bonding, as three Guernsey residents who completed this year’s event are now able to testify. Brian Bougourd, John Bell and Daz Carre were among more than a thousand entrants on the start line in Morocco three weeks ago for the 29th running of the marathon of the sands. For each of them it was a supreme test of their individual strength, both physically and mentally. But just as important was the way they helped to pull one another through their six-day slog over 251 kilometers of unforgiving terrain in the blistering desert heat. Brian, 45, exceeded all expectations by finishing just outside the top hundred in 103rd position overall. His work colleague John, aged 47, came home 652nd while their friend Daz, the baby of the bunch at 32 years old, pulled through in 638th position, despite having to endure much of the race with a painful leg injury. With the light fading fast, the pair made it to a checkpoint where medical assistance was available. Daz was propelled to the head of the queue and was given a proper supportive dressing for his knee as well as powerful painkillers. ‘I’d never experienced a pain like that before,’ he winced. ‘I thought each step was going to be my last and that’s why throughout the whole thing I literally had to take one step at a time.’ Daz and John managed to keep on going throughout the night and they took 21 hours to complete that double marathon stage. The following day was a rest day and, as they prepared to tackle the final day’s course over a mere single marathon distance of 26 miles, they realised they had managed to get past their worst moment. ‘I knew if you could complete the long day, come hell or high water you will do the marathon,’ said John. ‘I loved that last day because I felt we were actually competing. We got to a quick walk but we were still overtaking others and moving through the field. We felt part of the race and it helped massively to be side by side.’ Daz said his emotions on finishing the Marathon des Sables were a mixture of exhilaration and disbelief. ‘The way we got through the marathon stage was nothing short of unbelievable – me with my busted leg and John with his busted feet. It’s still not sunk in but it was definitely life changing. While Daz and John were struggling with injury, Brian was simply keeping on going further up the field. ‘It was everything I wanted it to be, really well organised, a great big event, multinational and a fantastic challenge all round,’ he smiled. ‘Finishing each day was just amazing, it just felt so, so good and the relief rushed through me.’ Although he was never racing alongside his two friends, Brian played his part in supporting them at the end of each day when they were all reunited in their living accommodation, Tent 145, together with another five fellow British participants. ‘Tent life was just fabulous,’ said Brian. ‘Just one tent among 40 others and that was home. The people in that tent were our mates, our family, and we looked after each other. If anyone needed anything we’d lend things out, swap meals, just to get us all through.’ John added that Tent 145 would live with him always while Specsavers employee Daz agreed it was the thought of reaching the camp that had kept him going. ‘Crossing the finish lines and getting back to camp to swaps tales with fellow runners, lazing about and cooking with those guys, it was brilliant – what we all looked forward to. Despite his experience and preparation, John admitted in hindsight he had got it wrong in one respect – the shoes he had chosen to do the race. They allowed water vapour to escape as planned, but not quite fast enough, and they were also a little too big. It was this mistake that resulted in John’s feet blistering so badly, despite the fact that the gaiters he wore stopped even a single grain of sand getting to his feet. There were no such problems for Brian, whose only truly anxious moment was when he came close to running out of water one day, and apart from that he simply got stronger as the race progressed. ‘With a bit of luck and a bit of judgement and a bit of good planning it all just came together,’ he smiled. Having originally set out to be within the first 200, by the final day Brian had reached his goal comfortably. With just the marathon distance to do and the rest day behind him he decided to savour experience, take it all in and simply enjoy it. 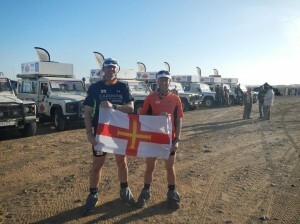 As they looked back on their sojourn in the Moroccan desert just three weeks ago, not all of the emotional dust had settled as the Marathon des Sables runners continued to readjust to island life. Without doubt, though, it has been a life affirming experience, and Brian summed up their feelings when he said he just felt fortunate. Brian, John and Daz were helping charitable causes through their participation in this year’s Marathon des Sables. Daz is raising funds for the GSPCA at www.justgiving.com/daz-carre and for the Specsavers Childrens Charity at www.justgiving.com/daz-carre1. This article was written by Martin Tolcher and was first published in The Guernsey Press. All rights acknowledged.